Born in 1943 in the wartime relocation camp of Poston, Arizona, the Hon. 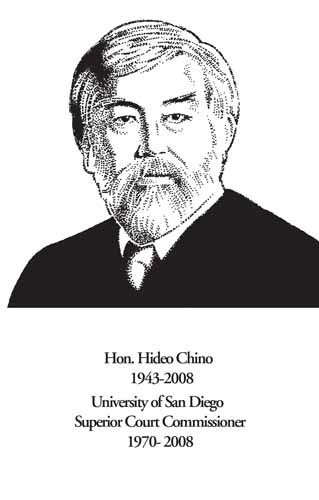 Hideo Chino was the seventh of nine children born to Japanese immigrants Junzo and Hatsuyo Chino. While his three distinctly separate interests – the law, bluegrass music and cooking – kept him active, Comm. Chino pursued a long and successful legal career that spanned more than three decades and impacted the lives of many of San Diego’s children. Chino grew up working on his family’s famous 50-acre Chino Farm in Rancho Santa Fe with the expectation that he would go on to college. But he exceeded his family’s expectations and not only earned a degree in microbiology in 1996 from San Diego State College, but went on to earn his law degree from the University of San Diego in 1970. Comm. Chino began his civic-minded career serving as the assistant city attorney for the city of Del Mar while affiliated with the firm of Worden and Williams in Solana Beach. His later private practice specialized in juvenile and criminal law and prepared him well for his position as a Superior Court Commissioner where he served from 1986 until 2008. He was known for a wonderful rapport with children and an extraordinary ability to deal with difficult cases. Throughout his life, Comm. Chino developed his love of bluegrass music and cooking. He was known as one of the best bluegrass players in the area where his talents for acoustical guitar, flatpick guitar and mandolin were shared with audiences throughout San Diego. His musical talents were matched by his aptitude for cooking – particularly the baking of breads for which he studied at Acme bakery in Berkley and the National Baker’s Guild in Minneapolis. He is survived by his wife the Hon. Sheridan Reed; son Matsuo Chino and daughter Mayumi Chino and stepchildren Marty and Michael Reed as well as by two sisters and six brothers.